I think I have the agility to hop over most pesky food rules that get in my way, but I recently came to one that I couldn’t quite clear: seafood + cheese = disaster. I’ve heard that combining cheese with fish in an Italian kitchen could get you disowned, but I have a hard time believing that the French could keep two dietary staples perpetually separated. So, this could be a cultural issue. In any case, I know one thing from experience: cheese can behave much like red wine when it meets fish, and the wrong choice can absolutely ruin a dish. Blech. So. Fish and cheese. Let’s get to the bottom of this. Barring jumbled-up dishes like seafood pie, the delicate taste of most seafood is easily overwhelmed, and that means mild cheeses are better choices. But texture is important, too: unless you’re going for a homey seafood casserole, stringy cheeses tend to rub fish the wrong way. Creamy works much better, but watch out for luscious cheeses that have heady aromas (Livarot, Camembert and Pont-L’Eveque come to mind). I decided to take a bit of a risk, walk that tightrope between innovation and ruin. I went for blue cheese and grey shrimp (here in Belgium, grijze garnaal): a bold and moldy treat with the tiny, briny jewels of the North Sea. And it totally worked! 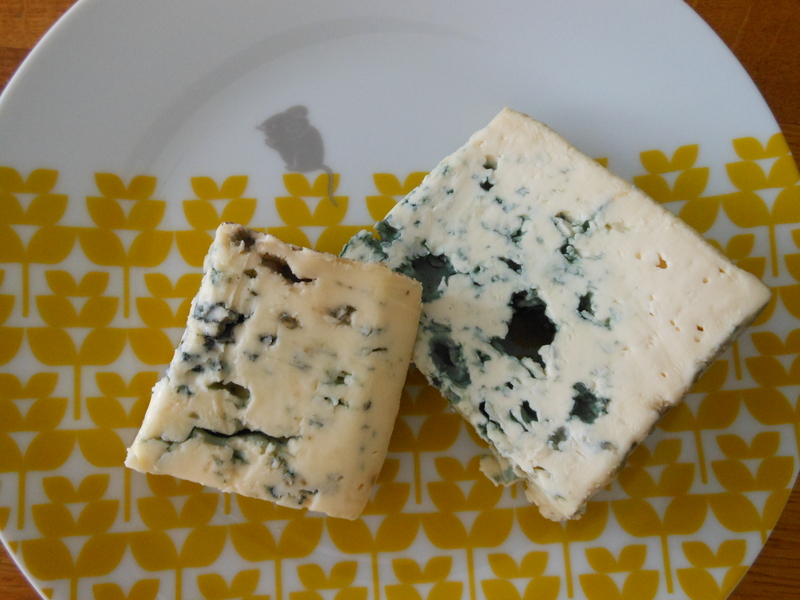 This was obviously no stage for Roquefort, but there all all sorts of mild and creamy blue cheeses out there, and since they melt so well into a creamy sauce, I thought I’d give them a shot. I wound up using two — Bleu D’Aurillac and Fourme D’Ambert — but I used them sparingly, which, I think, was the key to success. 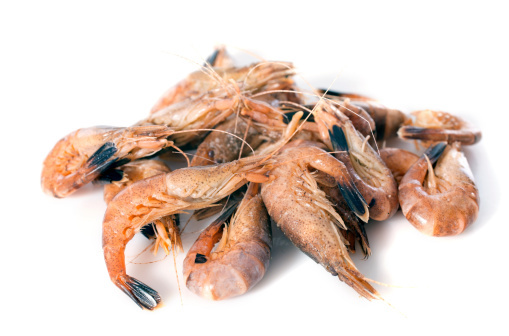 The shrimp, though tiny, are not as delicate in flavour or texture as you might expect. 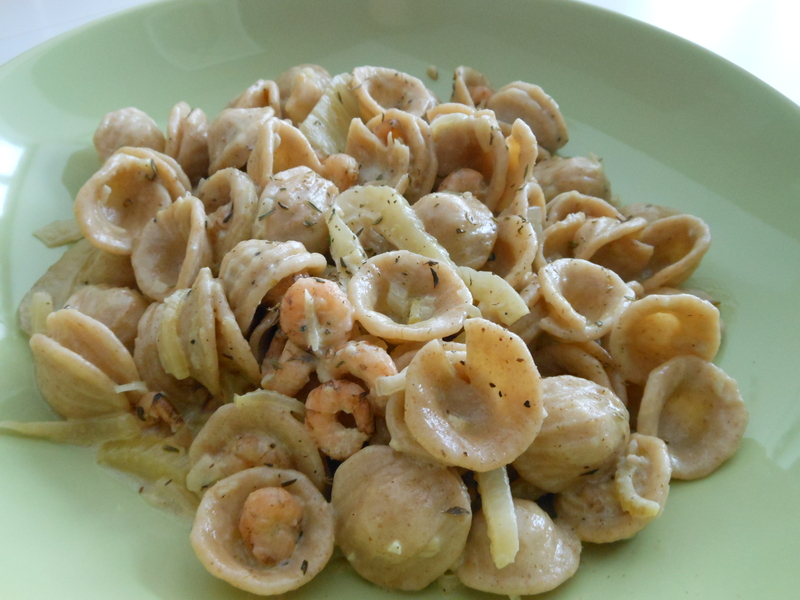 In fact, their briny taste and firm flesh go perfectly with the chewy orecchiette and salty bite of blue. But you do need a lot of them, so you may want to recruit an assistant to help with the shelling. I chose fennel for it’s mild anise flavour (adds a bit of depth) and it’s sturdy flesh (just a little crunch), and instead of using reduced-fat dairy, I cut the the heavy cream with veggie broth. This way, there’s still a ton of flavour, the sauce reduces well without curdling, and you save a few calories. Yay. I can confidently state that this is one of my new favourite pasta dishes. Poor Paul missed out on the revelatory experience, but all the more reason to make it again next week, when he returns to Belgium. You’ll need two pots and a pan for this. First, bring a large pot of salted water to the boil and prepare to add your pasta (keep in mind that the sauce takes abut 15 minutes to prepare, so time the pasta accordingly). In a pan over medium heat, melt the butter and saute the shallots until translucent. Add the garlic and cook, stirring, until aromatic. Deglaze the pan with a big splash of white wine, and once most of the liquid has reduced, add your fennel. Saute for 5 minutes, or until the fennel begins to soften. Stir in the shrimp. Meanwhile, in a small pot or saucepan over medium heat, add the heavy cream, veggie broth, thyme and some fresh pepper. bring it to a boil and cook, stirring now and then, until it begins to reduce and thicken (give it 5 to 10 minutes). Remove the pot from the heat and whisk in the crumbled blue cheese until smooth, then taste and adjust salt and pepper as needed. Add the blue cheese sauce to the fennel and shrimp mixture. When the pasta is just short of al dente, add it to the pan with the sauce (but reserve the pasta cooking water), and toss to coat. Continue to cook over medium heat for another minute or two, adding a bit of pasta water to thin as needed, then dish out into bowls. Add a little fresh thyme for garnish, if you like. Enjoy!